Many people are interested in the future of our iconic Borough Council chambers on the corner of Mt Albert and Mt Eden Rds in Three Kings. Yesterday the issue was raised by a correspondent to 'Ask Phoebe' in the Herald. This has been a major issue for us over the past couple of years. The building was closed down in 2011 due to water ingress and toxic black mould. It was effectively a leaky building due to shoddy renovations in the 1990s. Following that, there was a real push from some parts of Council to 'exit and demolish' the building. We fought hard against that and ensured that the Board put it a strong position in favour of restoration. Garth Houltham and the Mt Roskill (Puketapapa) Historical Society organised a 1000 strong petition of local residents in support of saving the Chambers. In March of this year a deputation from the Local Board was successful in getting Council to take the 'exit and demolish' option off the table. the next step is to secure the funding to restore the building. We maintain that it must be restored for civic and community use. 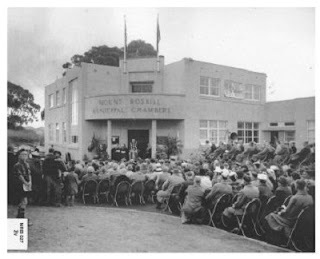 The building is of immense local heritage value, and is one of the few remianing landmarks from Mt Roskill's heady development in the post-war period. Restoring the building will provide much needed community space, and the additional cost will not be much more that demolishing it and finding the Local Board a permanent new home. Next month the Board will send a deputation to Council's Strategy and Finance Committee to try and advance the business case for investing in the restoration. Our local heritage matters and we will be fighting hard for restoration.